The epitome of an ideal Japanese woman, Maiko are a lasting remnant of the unique culture of hospitality in Japan. There are many who visit the old capital to experience this “heart of Japan” for themselves. Beautiful and elegant Maiko can be seen amongst the scenic landscape of Ninenzaka, one of the quintessential areas of the old capital, located in Kyoto Higashiyama. We invite Maiko from “Kawa Yoshi,” one of the oldest okiya (geisha houses) in the Gokagai geisha district of Miyagawacho, to perform a Wakayagi-ryu dance at Kamanza. We have many plans available for you to enjoy the Maiko perform a gorgeous Kyoto dance, as well as chat with and take pictures of her while savoring a meal or tea and sweets after exploring Ninenzaka. We hope you will join us for this fantastic opportunity. From the Edo Period, it is believed that after going to Yasaka Shrine and Kiyomizu-dera Temple, many pilgrims would visit Maiko at their okiya to be entertained by their dance and shamisen performances. 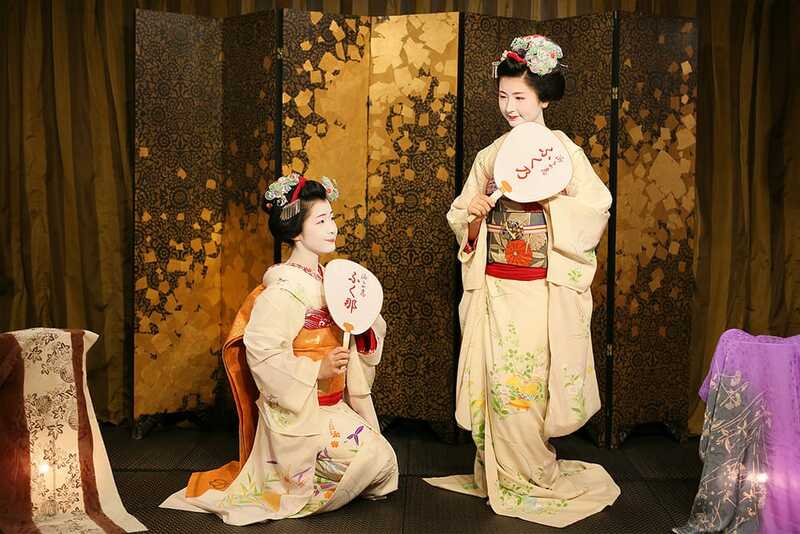 There are now five geisha districts in modern Kyoto, known as the “Gokagai,” they are made up of Miyagawacho, Kamishichiken, Gion Kobu, Gion Higashi, and Pontocho. Most Maiko undergo intense training for about five to six years starting when they are around 16 years old. 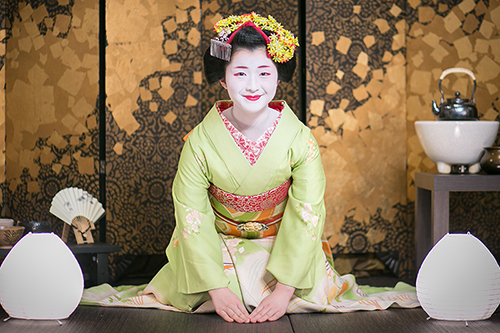 The tradition of training Maiko itself is also a part of Kyoto’s long-established “hospitality” culture. 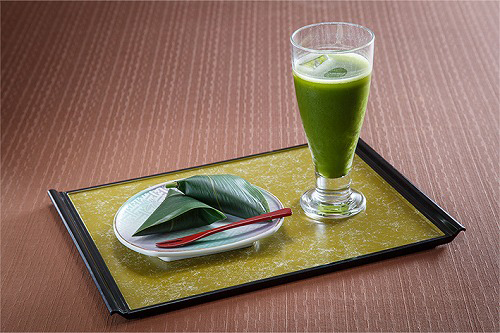 Enjoy an afternoon of sipping tea and eating refreshments with a Maiko. ※Must have a group of 6 or more. 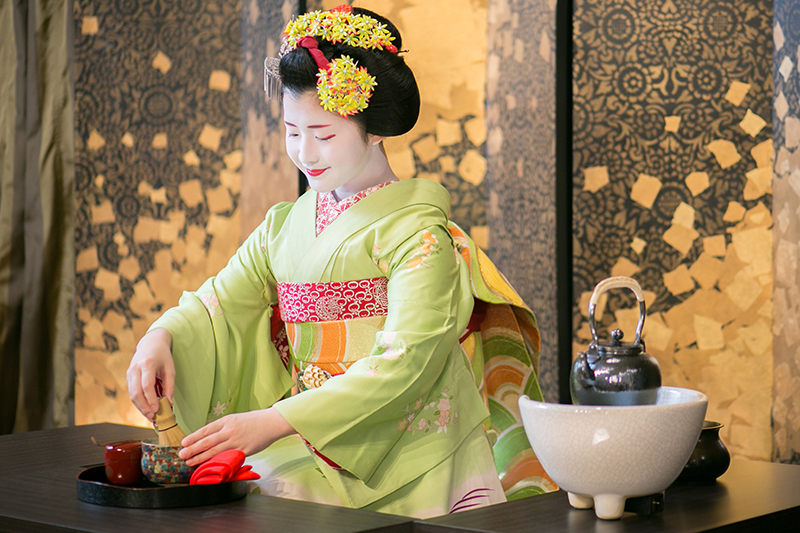 ※If you would like to request a tea making performance from the Maiko, reservations are required at least two weeks in advance. Must be for a group of six of more. ※Reservations are required for the show. They are taken up until the day of before 3:00 pm. Reservations until the day before can be made by email or the phone. Reservations made on the day of must be made in person or by phone. ※Shows will be held for groups of six and above. If there are not at least six people who have reserved to see the show by 3:00 pm, it will be cancelled. After reserving your show, we will let you know whether it has been cancelled or not by contacting you before 3:30 pm. ※We cannot accept cancellations on the day of the show. ※Private shows for groups of 20 or more can be held, however, they need to be booked at least two weeks in advance. ※The above fee includes the service charge for one Maiko. The fee is 32, 400 yen (including tax) per additional Maiko (or accompanist). Some days may not be available depending on the Maiko’s schedule or a private show. 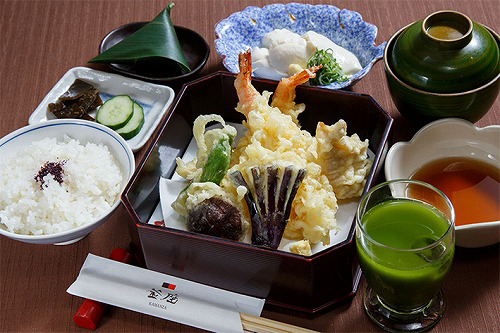 A plan that allows you to enjoy a delicious meal and enjoy a Maiko performance. You can also take pictures together. The Maiko will come about 30 minutes after your meal has been served. Her performance will be for the last 60 minutes. The cost of the Maiko’s service charge per one person. After your meal, the content is the same as the Tea Drinking Plan. Held for a group of six or more. Must be reserved at least a week in advance. 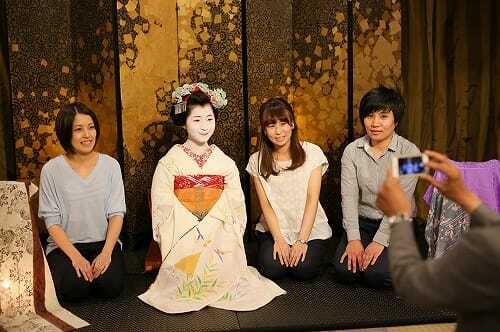 Spend 120 minutes with a Maiko. The fee for the Maiko’s service charge and dinner cost per person. Other options are available depending on your budget. The content is the same as the Tea Drinking Plan. Additionally, you can eat and drink with the Maiko as well as chat with her, in a style reminiscent of days of old. Held for a group of ten or more. Must be reserved at least two weeks in advance. ※Besides the start times, there is no difference in content of the afternoon or evening Banquet Course shows. ※Reservations are required for Meal Plan Shows. They can be made by email or phone. The “Simple Course” reserved at least one week in advance. The Banquet Course must be reserved at least two weeks in advance. ※There is a set minimum number of participants for each course. For the “Simple Course” it is a group of more than six For the “Banquet Course” it is a group of more than ten. ※If the show is cancelled by the customer, the following cancelation fees will be applied. ※ Private shows for groups of 20 or more can be held, however, they need to be booked at least two weeks in advance for either course. Private groups can be up to 36 people. ※The above fee includes the service charge for one Maiko. “Simple Course” An additional Maiko or accompanist will be 32,400 yen (including tax) for 60 minutes. 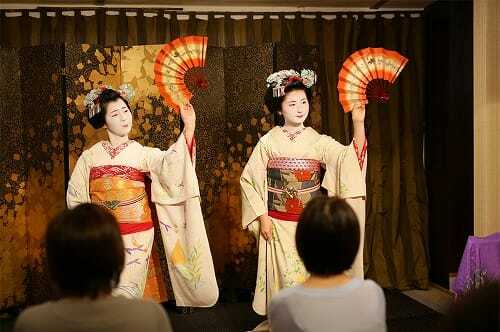 “Banquet Course” An additional Maiko or accompanist will be 54,000 yen (including tax) for 120 minutes. ※Drinks must be purchased separately. ※The meal for the “Banquet Course” is usually a Tempura Meal Set, however depending your budget, the meal offering may be changed. Please ask for more details when making your reservation. ※Depending on the season, the meal offerings my differ from those pictured. ※Enjoy the matcha tea you’ve prepared yourself. ※ Reservations are required for the Tea Ceremony. They can be made by email or phone at least one week in advance. ※There is a set minimum of a group of more than six for this plan. ※For this plan, the first 45 minutes will be done learning and conducting a tea ceremony, and the second 45 minutes will be spend with the Maiko. A tea ceremony master will demonstrate and teach you how to prepare the tea. The Maiko will only join for the last 45 minutes. ※ Private shows for groups of 20 or more can be held, however, they need to be booked at least two weeks in advance. ※ The above fee includes the service charge for one Maiko. ・Reservations and inquiries can be made by both phone and email. We can accept calls on weekdays between 11:00 am and 4:30 pm, and between 11:00 am and 6:00 pm on weekends and holidays. It may take some time for us to reply to your email. Please note that reservations for or inquires about shows one day before or day of, are only accepted by phone. ・Please be aware that the reservation period, minimum number of people required, and cancellation policy differs by plan. ・If an interpreter is brought with your group, they will be able to join free of charge, however they will not count toward the minimum group number. Food/drink for the interpreter is not included in the plan and must be purchased separately. There is a minimum number per group for each plan, but we may be able to accommodate some requests for smaller groups. If the members of the smaller group can pay equal to the total fee of the usual minimum group, we may be able to provide a show like in the example below. 25,920 yen÷4 participants＝ 6,480 yen　→　per person A fee of 6,480 yen（tax included）will be necessary. Please contact us if you would like more details on smaller group plans. For private parties, we may require a portion of the total cost as a deposit. The reservation will be completed after the deposit is received. Feel free to inquire further when you make your reservation. ※All prices displayed on this page include tax.